The Orient pears can be easily confused with the Asian pears. It is large and round in shape while its skin is yellow with smooth textured, juicy, firm and sweet flesh. They are hardy ornamental pear trees with 300 chill hours. They normally do well with pollinators such as Kieffer, Moonglow and Bartlett. Oriental hybrid pear yellow fruit is juicy, creamy fruit with mild flavor. They can be eaten fresh or used in canning desserts or salads. They do well in climate zone 5 through to climate zone 8. This large vigorous tree bears heavy, yellow fruits. 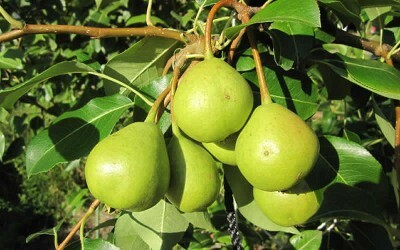 It is quite a tough pear tree, which is blight resistant and widely known for its elegance. It has a long life span and can be depended upon for long term fruit bearing. It requires little maintenance and it’s self-fertile. Nonetheless, they can be pollinated with other European pear varieties except the Kieffer. The standard Oriental pear tree seedlings are normally budded onto whole root stock. The dwarf seedlings are often grafted to Quince. Being a tough tree species, it does well in wide range of soils. They do well in slightly acidic, heavy, deep, moist and well-drained soils alongside optimal temperatures are ideal for this pear tree. Other soil types may be tolerated, however, this may result to production of a lighter crop. They cannot do well in salty soils. They require between 350 and 400 chill hours for steady and healthy growth. For pollination to take place, the Oriental pear needs a compatible cultivar. The standard pear tree grows up to a height of 100 feet while the semi-dwarf and the dwarf trees grows up to a height of 50 feet and 20 feet respectively. They exhibit simple, green leaves that grow alternately to the twig. They have smooth, fine teeth on the margin with a golden bronze fall color. They are normally harvested from mid-August to mid-September. The flowers cover the tree with their white elegance when they blossom in the spring.